I remember my first sight of the old Albert Kessel farm. Nestled on the number Four Saskatchewan highway halfway between Biggar and Rosetown, I loved it from the moment I laid eyes on it — through the window of the truck on my way for my first visit to my then-boyfriend’s parents’ farm. “Wow!” I remember saying. “Look at all those great trees!” A northern Saskatchewan bush girl, I hadn’t yet become attuned to the distinctive and iconic prairie landscape. The spruce and jackpine seemed a dollop of ‘home-as-trees’, stretching to brush the clouds of the prairie sky. I couldn’t predict, then, that one day I would own that piece of land. When luck looped through our world and the land came into our ownership and stewardship, I found numerous treasures embedded in the landscape. Stone fences, crumbling. An old road, now leading nowhere. An orchard, the last few hardy trees still birthing fruit. A well, which, when primed, still spills forth fresh water. Another wellhead, furtively tucked under trees and surrounded by growth, littered with empty whiskey jugs – the remains of a still? 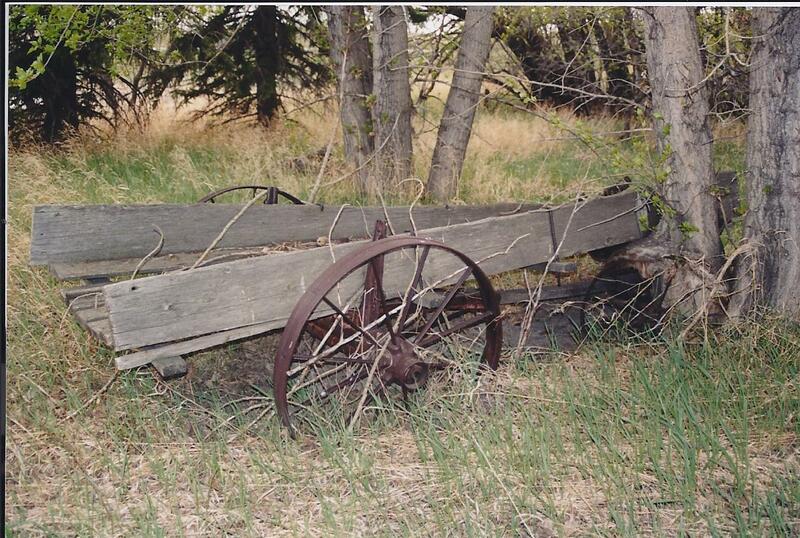 A steel-wheeled wagon, abandoned so long that its front right wheel is encased by the tree that quietly grew from sapling to spire, anchoring the wagon to the earth, ending its rolling days. 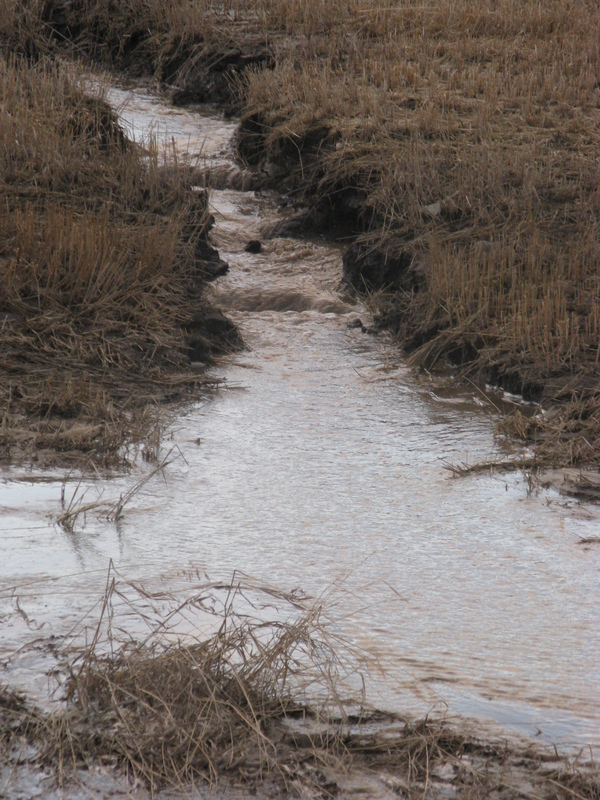 A swatch of the Bear Hills, never tilled, native prairie warming the soil like a thick kokum’s quilt. Wagon at the Kessel farm. Merle Massie collection. One hill in particular rises to attention, flowing above the farm and the circle of pine and spruce. At its top, a cairn of stones cradles an old, rusted, flagpole. 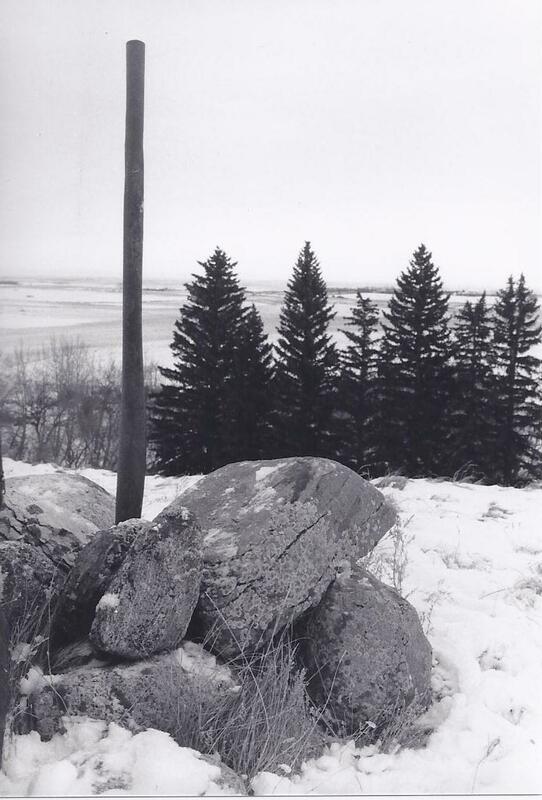 Flagpole at the Kessel farm, 2006. Merle Massie collection. Since our purchase, I’ve been trolling the memories of neighbors, local museums, and community history books, gleaning accounts of the farm’s original owner: Albert Kessel, a garlic-chewing, eccentric, WWI bugler, journalist, Czechoslovakian master prize-winning bachelor farmer crossed in love. Fascinating. Albert Kessel, 1958. 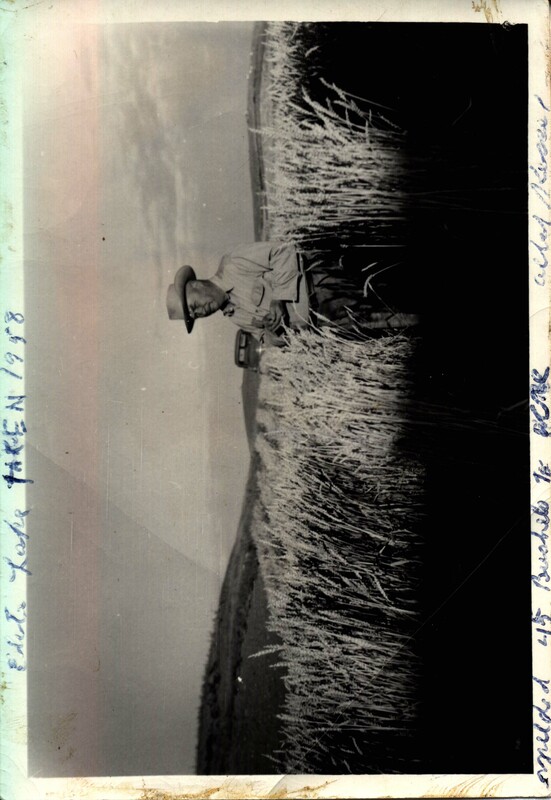 “Yielded 45 bushels to acre.” Hills in background. Courtesy Biggar Museum. I wrote about Albert Kessel and my search for knowledge about him in 2008, published in the June/July issue of The Beaver, now Canada’s History Magazine. 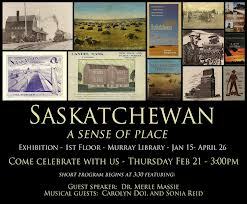 I knew that Kessel operated a demonstration farm, which was widely-known and visited every year on field day by as many as 400 researchers from the University of Saskatchewan, federal experimental farms, the Searle Grain Company, neighbors, and busloads of schoolchildren. He called it Vimy Ridge Farm. Kessel was a bugler during WWI, shot through the thigh at Vimy Ridge. 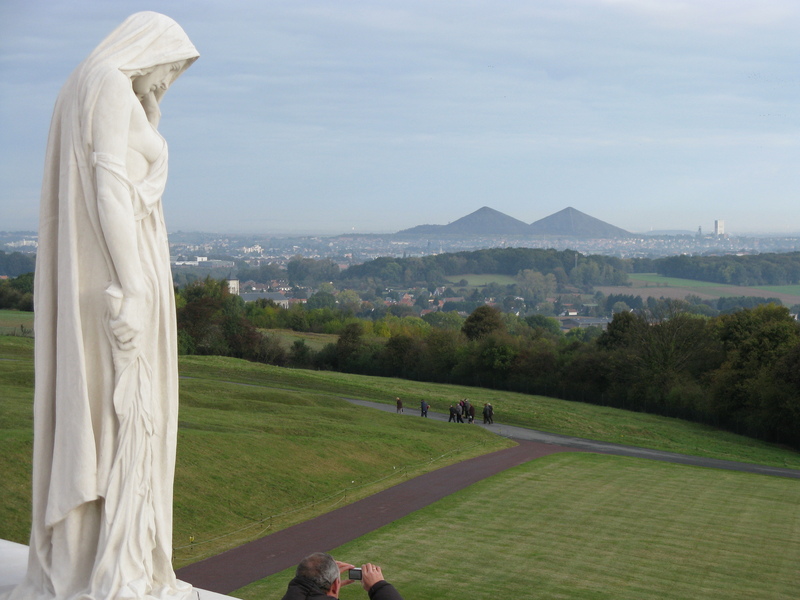 In my article for The Beaver, I wrote: did this hill remind Albert of Vimy Ridge? Is that why he called his farm Vimy Ridge Farm? Did he ever blow his bugle up here? I thought it most likely that the hill, or the series of hills, reminded Albert of his harrowing French experience. In salute, Kessel erected a flagpole and every day, he would stump up the hill and fly a British flag. At the time, I had never visited the real Vimy Ridge. All I knew of the site was confined to history books and photographs, a landscape of the imagination but never of experience. I thought that Vimy Ridge was like Hill 70 or another strategic marker on a theatre of war where every height of land meant a mile more of sovereignty. That changed in 2009, when I visited Vimy Ridge during a conference tour of Belgium and France. The experience was overwhelming. The imprint of war on the landscape is still tangible. I visited the tunnels, shuddered at being underground, and felt my jaw drop as my eyes skidded over the craters and hummocks that pock the grass – debris from bombs that exploded on the landscape nearly a century ago. Whether or not you believe that Canada was forged at Vimy Ridge – and I’m not a pinpointer of history – knowing that you stand on Canadian soil in the middle of France redefines your perception of what it means to be Canadian. But it was at the monument that I had my epiphany. And I wasn’t looking at the monument when it happened. I was looking out, at a flat French landscape that was both foreign and intimately familiar. I was reminded of my own words in that article I wrote for The Beaver: To the north of the yard is a commanding hill, hosting a phenomenal panoramic view of the prairies in a fifty-mile swing from east to southwest. France, from Vimy Ridge. Merle Massie collection. 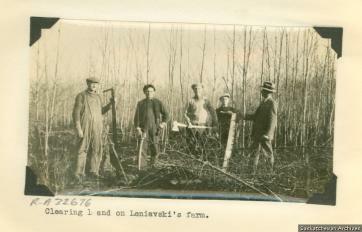 I knew, in that instant, why Albert Kessel named our farm Vimy Ridge Farm. It wasn’t about the hill – it was the view. From both Vimy Ridge in France, and Vimy Ridge Farm in Saskatchewan, the two landscapes provide a near mirror-image of space, sky, and panoramic earth. Of course, France is covered in towns, villages, trees, and industry: the pyramids are piles of coal, and that is what both armies wanted. Saskatchewan provides a relatively empty prairie view, studded with a few isolated farmsteads and an expansive agricultural skin regularly grown and shaved by generations of farmers. When Alan MacEachern issued his lovely summer call for photographs of historical landscapes (http://niche-canada.org/node/10423) I considered where I might go, what I would like to see. But my heart knew that I had already made this trip, even if it did not conform exactly to specs. My story draws together two landscapes separated by an ocean and half a continent, and almost a century of time. The story of Vimy Ridge, and the cascading memories of place, connected a little farm in Saskatchewan with an iconic Canadian symbol. One day, we’ll raise the flag again. We’ll do it for tenacious Saskatchewan homesteaders; for unlucky romances; for Great War and Vimy Ridge veterans; for excellence in prairie agriculture; and, for garlic-chewing bachelor farmers. 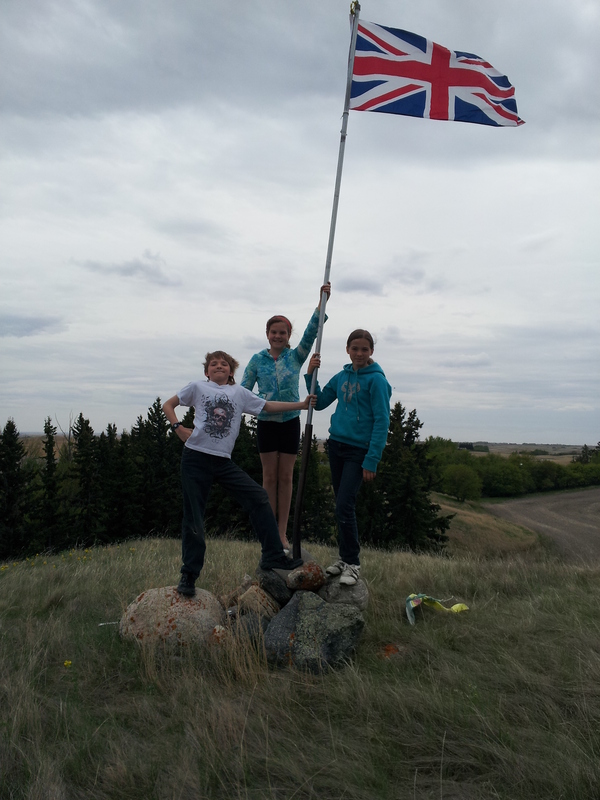 Vimy Ridge Farm Flagpole, 2012.